Sign up not required, just join us! Are you studying Biology or Environmental Science? Wonder what to do after graduation? Looking for career options to pursue your passion for nature? 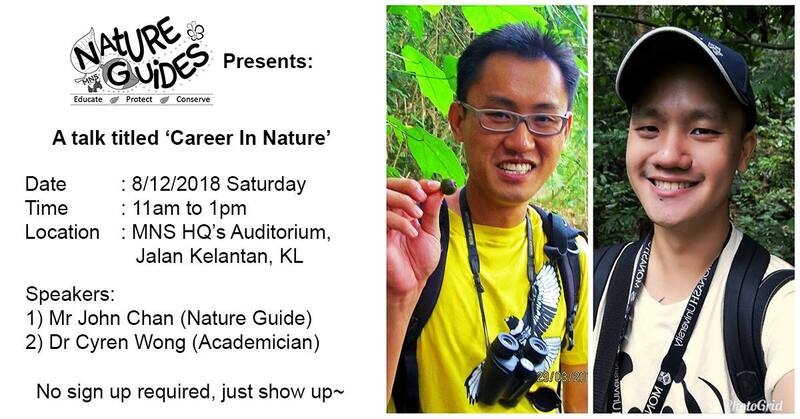 Come hear John Chan and Dr. Cyren Wong share their journey in ecotourism industry and academic pursuits. Find out why they love what they do, the people who inspired them and their trials and tribulations. John Chan is a Jungle/Nature Guide. After graduating from University of Malaya in Biology, he provided tutoring service. He grew restless from being indoors and ventured into nature guiding work, a perfect combination of his passion for outdoors and biology. He has been organizing unique eco-trips and nature hikes around Malaysia and Indonesia since 2007. John works very closely with local and native communities in Malaysia and Indonesia to promote their arts, culture and the environment in which they call home. As an advocate of responsible tourism and sustainable living, John is an active member of Malaysian Nature Society from 2007 to present. He is committed to a life-long mission to champion nature, conservation & cultures. He started the platform “Nature Inspired” (https://www.facebook.com/mynatureinspired), an ecotourism alliance and organizer of responsible and affordable eco/culture/food trips. Despite a strong passion for nature that began early in life, Dr. Wong’s journey in biodiversity and conservation work only began recently in 2012. While many of his peers were entering the work-force at the time, Cyren made a decision to further his education by pursuing a PhD, which he saw as an opportunity to further immerse himself in the understanding and protection of Nature. The research he conducted – which seeks to bridge the divide between Indigenous wisdom and scientific knowledge on flora and fauna for the purposes of community empowerment and biodiversity protection – thrust him into the heart of several Orang Asli villages where he was subsequently adopted, and lived, for the better part of 2 years. At present, he is working for the Directorate of Monash University Malaysia, where he divides his time between conducting lectures and driving the University’s biodiversity projects and exhibitions. He is also the founder of “Naturetalksback” (www.facebook.com/Naturetalksback), an educational platform that seeks to educate and engage with youth on matters pertaining to biodiversity and nature.